The Soil Health Institute (SHI), the nonprofit organization charged with safeguarding and enhancing soil health, has announced it will launch “Healthy Soils for Sustainable Cotton,” a continuous engagement project to help U.S. cotton farmers increase soil health on their farms. In addition, the project will seek to quantify and expand the productivity, economic, and environmental benefits of soil health systems for those farmers. 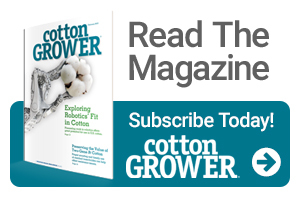 The initial pilot program, which will be conducted during 2019, will include cotton producers in Arkansas, Georgia, and North Carolina, according to Cristine Morgan, Ph.D., SHI Chief Scientific Officer. “Cotton producers who successfully complete the program will gain knowledge in soil health systems and become part of a network of farmers interested in increasing sustainability of cotton production,” Morgan added. According to David Lamm, Project Manager, the project will identify farmers in each state who are successfully adopting soil health systems. These farmers will provide insights into their soil health systems and help mentor others who participate in the training program. In addition, a local Soil Health Technical Specialist will help conduct farmer training and provide continuous technical support over at least the next two years. Participating farmers will learn how to evaluate the health of their soils and how to improve that health for greater sustainability. Scientists from SHI will assist growers in assessing and improving drought resilience, economic benefits, and environmental outcomes of their practices. “Healthy Soils for Sustainable Cotton” is supported through the generosity of the Wrangler brand, the VF Corporation Foundation, and the Walmart Foundation.